One of the curitial parts of a game is your UI and it will impact your gameplay a lot. Today I’m not going to talk about it’s design, but I’m going to show you how to develop a UI system for Kinect. On desktop you can control your UI with your cursor but if you have ever done a game with Kinect, mouse cursor is not an option. For Unity you can come up with different solutions for this, like raycasting and making bunch of prefabs but it’s hard to implement and takes so much time. Thus, I believe there is an easier solution for this, which is of course Unity’s new UI system. Unity 4.6.6, you can use any of 4.6+ or 5x versions. Kinect v2 and you can download it’s drivers and also Unity plugin from here. After downloading and importing Unity Kinect plugin, add KinectView folder into your hierarcy. Thats all you need for your basic setup. You can check the demo scene inside KinectView folder and see if your setup is correct! Get the hand or hands from Kinect body, and process their positions and update input module relative to those positions. Process the actions like hovering, clicking and dragging. Add clicking options like waiting over a button or tracking open and closed states of your hands. First we are going to make our KinectInputModule class which is going to be a subclass of Unity’s BaseInputModule. There are some overridable methods inside BaseInputModule which are ActivateModule()(Start method), Process()(Update method). You can check out documentation for more information abour them. So we can use Process() method to track hovering, pressing or drag actions. Before we start coding, we have to consider we are going to track maybe both hands(later more than one body), so we need a class like a holder. And some enumarations for a clean look. // Process waiting over components, if hovererd buttons click type is waitover, process it! So in this class we have KinectInputData array, it’s lenght is going to be 2 for our right and left hands. And we are going to update it with TrackBody method. When we press a component(with processpress method), set a temporary screen position. While processing drag compare current hand position axis values with temporary one. If values are bigger than a treshold set IsDraging as true. That’s all we need to do to make a Kinect hand cursor. You can download the full code from here. Have fun with it! Hey man! Great job! This is a major issue for people who want to make kinect games and use unitys built in gui system. It says Type or Namespace can not be found. I am wondering if I need an include or something. So to get rid of that error you can create an empty script named as “KinectUIWaitOverButton” and fix it for now and wait for me to upload the whole project to github it will take just one or two days. My github is https://github.com/paganini24/ you can follow me there, thanks! Thanks for the reply! I totally understand that, and you are followed! P.S. After looking on the web for this for a while I saw many people are having the same problem for Kinect games. You should put this on the Unity Asset Store!! Hi there, I just updated the article, you can check the same link down below to download the sample project from git. It’s on github now so feel free to use, It’s not necessary but if you can add my name to your game’s credits I would be so glad. I don’t about Asset Store, if I can prepare a good documentation in the upcoming days I would surely. Thanks for the tip! Ya let me know if you do! I would love to give you good reviews! Ill add you in for sure, and link to it when I get it done! I would get a Unity tutorial scene/readme up and submit asap! Ok thanks for that, good luck with your game! I’ll post an update if I it’s published on asset store. Thanks for the tutorial, this is great :D.
I download your project from GitHub, and I open it using Unity 5.x, then project upgraded. But, Unity found error on ClothTest.cs file. It said that Type or namespace name “SkinnedCloth” could not be found. Is there any file or dll that I missed ? Hi, it’s a test script so you can delete it. I was using it with Unity4’s cloth component and with Unity 5 that component has been changed that’s why you are getting the error, you can safely delete it! Thanks for making the tutorial! I am a new bee learning unity and kinect. May I ask if this compatible with using Kinect V1? Never tested with Kinect V1 sorry, please write me an update if you try with that also, thanks. I’ve been looking into various forums and I did not find forums that discuss tutorials, explanations and UI that is easy to understand. Has anyone found another clue? Im trying to run your code in Unity 5.3, if i play the test scene all the buttons appear but i can click them or make scroll. help me please. can youYou code run in unity 5? I’m trying to integrate your input module as part of a small project I’m doing. However, there seem to be an issue where the UIs will break after the first place. The problem: The problem is that the first time I press play, the UI works okay, but if i exit play mode and re-enter play mode again, the hand cursor no longer works. Great tutorial, but recently I was trying to integrate this into my project and I was in the test scene and I’ve faced some problems. I’m using Unity5.3.1f and after the first play, whenever I try to play again, the hand cursor doesn’t work anymore. Not sure if you know why. Great tutorial. 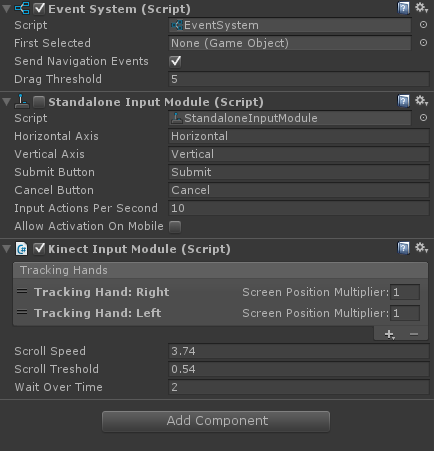 Im using unity 5.3 and when I play the test scene it does not detect my hand. Could you help me out with this please? yes, i have the same problem.. did u find the solution yet? hey… this is a life saver, and just what i needed for my current project.. The only problem is,that, though kinect is detecting me, once i click play, i cant find the cursor and am not able to move anything on the canvas.. can you please help me out? Can you show me the code for capturing screen shot from it too? i find this really helpful. this is my first time coding in c# and unity. can u make a video tutorial on this? it would be really helpful. anyways, great job! keep making tutorials! I think that there is problem with Unity 5.3. Handposition variable can’t be updated in KinectInputModule class. Actually, it is updated in UpdateComponent(). but it can’t be referred in GetHandScreenPosition(). Do you have any idea to solve this? Hi, I have lost my access to my Kinect recently so I am not able to update the package, if you find a solution feel free to contribute on Github, thanks. Would it work if I use Kinect V1? Firstly, big thanks for the module. I also get error with unavailable hand cursor. The problem is that possible number of tracking bodies is two. If you run “TestUIModule” alone (in your room), you will have only one tracking body. Second tracking body will be with zeroes values. These values overwrite values of the tracking body and cursor always stay at (0, 0, 0) position. in BodySourceView.cs only if body is tracked. Hi, thank you for your reply. Please feel free to contribute to github project also, thanks! Even running the test scene it rarely attaches the cursors to my hands. I don’t change anything in between it doing so or not doing so. It looks like this problem occurred for other people in the comments, but I don’t see any replies to it. Does anyone know what this issue is or how to fix it? It’s awesome when it works, but I can’t get it to function reliably. Does this work for the Kinect with MS-SDK 1.8? I only have an xbox 360 kinect and the sdk 2.0 only works with the xbox one kinect. Are you thinking about making a video? Please i have a question , in the README it is written (*First import Microsoft’s own Kinect library for Unity3D, you can find it inside the repository.) , i couldn’t find this in the repository , so i can’t use your kinect-inputmodule in my project . can you please explain the steps of importing your module in a unity project more clearly, as i need it urgently for my project ?